This page is still a work in progress. More content coming including installation videos! Assembly instructions are available for download at the bottom of the page. What is the recommended rim height? This will really be a personal preference based upon ceiling height, player height and intended type of play. However, we recommend at least 1.5 feet between the rim and the ceiling, but prefer 2 or more feet ideally. With many ceilings being 8 feet high a 6 foot rim height is pretty typical. Due to the fact these rims are mini we don't recommend putting any of our rims over 8.5 feet high. How do I find a stud in the wall? There are a few ways to find a stud in the wall. The most effective way is a...stud finder. What a clever name, right?! There are many different types available (magnetic, electric, etc.) and they will range in price from about $9-30 for a decent one. My studs aren't spaced 16" apart. Now what? 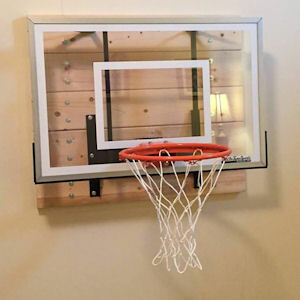 You can span your studs and still have a strong mounting surface for the hoop set. The image below was done with 2x6 boards. Some people will paint the wood to match the wall, do a dark backdrop or even a mural that looks like a crowd to create a game-like feel. What tools are need to assemble and install the hoop? How many people are needed for installation? For most people the 1.0 can be done solo, but having a second set of hands can always be helpful. The 2.0 could also be done solo, but due to its size, we'd recommend two people when attaching to the wall. All of our two stud mounts should be installed with two people. Do I need to hire a handyman, contractor, or other professional for installation? This will all depend on how comfortable you feel assembling and/or mounting the hoop set. Most people are able to assemble and install our hoop sets on their own. How do I install the hoop into a concrete/brick/cinder block wall? You will need a mason bit for drilling into the concrete as well as heavy duty mounting screws/anchors rated for concrete/brick/block, such as a wedge anchor, sleeve anchor, etc. Do not use the SPAX PowerLags we provide.